Had a great time here. We were staying at the Toumbakal about 20 something years ago. There was nobody there but several of us and some German tourists. They had a pool from which the beggars were kept, French cuisine (with chef) and a fantastic view. Here a friend of mine – Joe and I (me on back) take a spin on the maitradee’s moped. old pics 151, originally uploaded by Mic2006. I happened to be cruising the internet a few weeks ago and noticed in a guest book for my old Regiment – The Queen’s Regiment – the name of an old friend of mine – Andy Creech. We re-established contact after 21 years. Andy is on the left and I am on the right – a younger thinner me without a beard. It sure is good to know that he and other friends from back then are still in contact and it bought back memories of many good times. Andy is now married with children, having met his wife at the wedding of another old friend who had served with us in 2 platoon. The photo is of poor quality taken with an old 110 snapshot camera – hence the grainy appearance. We were on patrol somewhere (I remember where but would sooner leave that unsaid) We had found this barn in which to have tea and waste some time and so that is exactly what we did. I remember these great big tractor tires lying on top of the hay; several people curled up in them and got some sleep. As for sleep, we were always tired, I remember starting to see things on more than one occasion – due I think to lack of sleep. I suppose a loaded gun and seeing things is probably not an ideal circumstance. As for the old Regiment – it is no more. It became “The Princess of Wales Regiment” through some government restructuring. I am sure the new Regiment is a proud and worthy addition to the military but it is rather distressing to hear of the change. 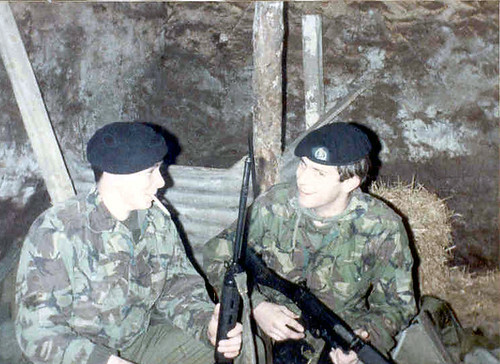 Andy was amalgamated into the new regiment and went on to serve many more years – retiring if I recall in 1996. It looks like after I left they served in some rather “dodgy” places – glad to see he made it through.